Tony Stratton-Smith (1933 – 19 March 1987) was an English rock music manager, and entrepreneur. 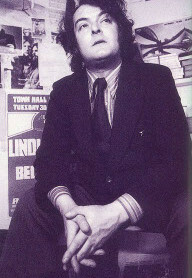 He founded the London-based independent record label Charisma Records in 1969 and managed rock groups such as The Nice, Van der Graaf Generator and Genesis. Stratton-Smith was born in Birmingham in 1933. He started his career as a sports journalist, mainly reporting on football, for the Daily Sketch and the Daily Express, before becoming influenced by The Beatles, in particular their manager Brian Epstein and decided to enter the music business. The first notable band he managed were Liverpool based The Koobas, taking over from Epstein. He subsequently took over management of The Nice in 1968 from Andrew Loog Oldham and, frustrated with the workings of Oldham’s Immediate Records label, decided to form his own. Later signings included the Bonzo Dog Band and Van der Graaf Generator. In 1969 he signed the progressive rock band Genesis onto his record and management companies, and released Trespass, the band’s second album. Genesis went on to become the label’s most commercially successful group. Stratton-Smith released many records by Monty Python and helped to finance the film Monty Python and the Holy Grail. He also recorded former Bonzo frontman Vivian Stanshall and financed Stanshall’s film Sir Henry at Rawlinson End, as well as being credited as its producer. Other important artists Stratton-Smith was closely associated with include Atomic Rooster, Audience, Brand X, Phil Collins, Peter Gabriel, Steve Hackett, Peter Hammill, Lindisfarne, Julian Lennon, Robert John Godfrey, String Driven Thing and Rare Bird. In the United States, Charisma Records recordings were often licenced to other labels such as ABC Records (including subsidiary labels Dunhill Records & Probe Records), Elektra Records, Buddah Records, Atlantic Records, Mercury Records and Arista Records. The label was eventually sold to Virgin Records in 1983. Virgin re-activated the Charisma name with a new logo for a short time during the late 1980s. The vast majority of the Charisma catalogue is now owned by EMI. Stratton-Smith died of pancreatic cancer on 19 March 1987 at the age of 53. A memorial service was held for him at St Martin-in-the-Fields, London. Marillion’s album Clutching at Straws (released in 1987) was dedicated to him in the sleeve credits. The song “Time to Burn” by Peter Hammill (1988) is “something of a goodbye to Tony Stratton-Smith”, and 3, the 1988 band of Keith Emerson, Carl Palmer and Robert Berry, dedicates the closing track of their only album, “On My Way Home”, to Stratton-Smith.